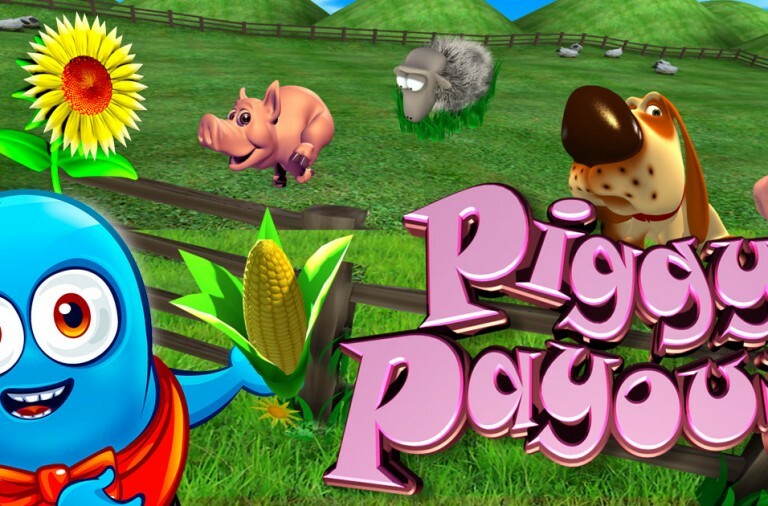 The games at Winner Casino are from one of the industry’s leading developers, Playtech. 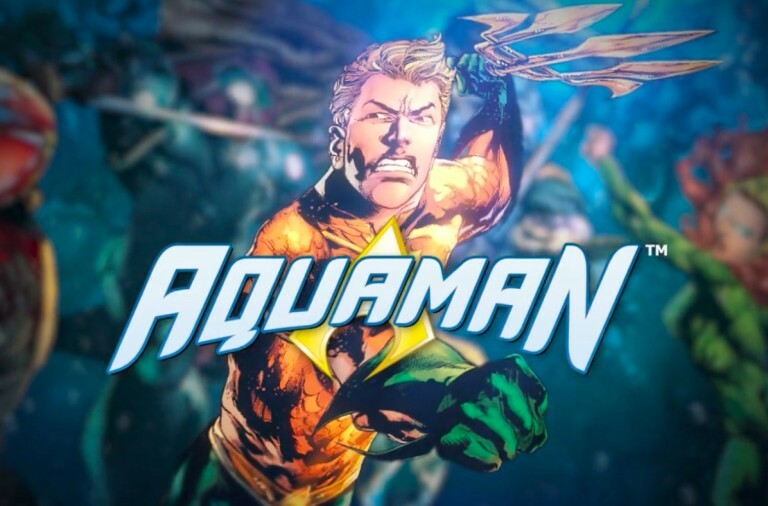 Playtech regularly release new and exciting titles and at the moment there are some truly exciting games in the pipeline. 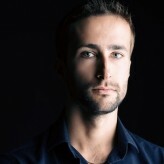 Read on to find out about what Playtech has in store. This slot takes you on an adventure in the jungle with a female explorer in search of treasures amongst the ancient ruins. The game starts with a video clip of the explorer being chased out of an ancient tomb by the jaguar and you are immediately launched into the action. Legend of the Jaguar is a 5 reel slot with 3 rows and 243 ways to win. The reels are set in a huge stone temple in the jungle with the explorer standing to the right of them. All of the symbols are related to the theme. The high value symbols are carvings of animals including the jaguar, a boar, a lizard, a bird and a fish. The lower value symbols are carvings of a tree, fire, water, and wind. There is a statue wild symbol and it can substitute for all the other symbols, except the scatter symbol, to help and form winning combinations. The scatter symbol is a mask. Every time that you land a winning combination the symbols in it will burst and allow more symbols to fall from above. Hopefully this will form another winning combination and the process will repeat itself. Furthermore, with each consecutive win the payout multiplier will increase from 1x to 2x to 3x to 5x. 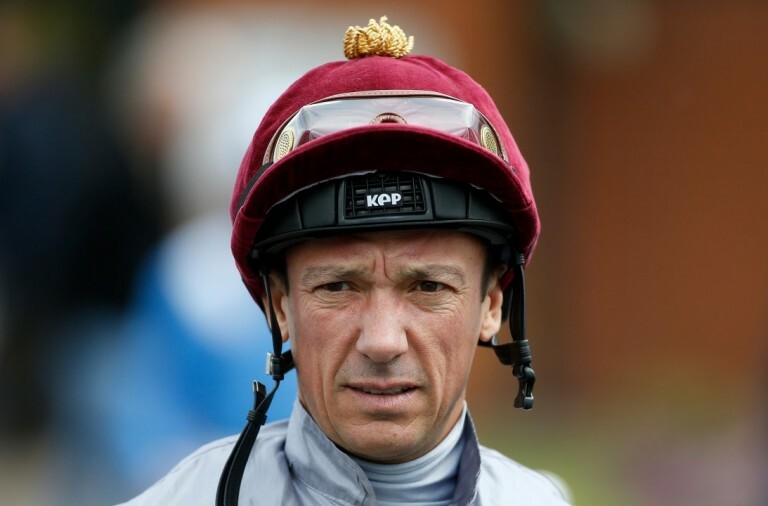 As a result, a single spin can produce a huge amount of winnings. If the jaguar symbol lands on the third reel the Jaguar Respins can be triggered. During the respins the Jaguar symbol expands on the third reel and turns the entire reel wild. The other reels then respin until you land a win. 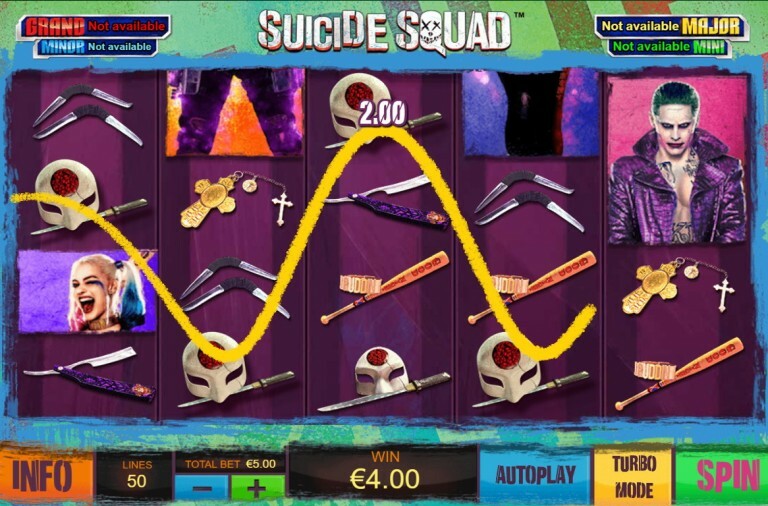 The free spins are triggered when the scatter symbol lands on reels one, three and five simultaneously. 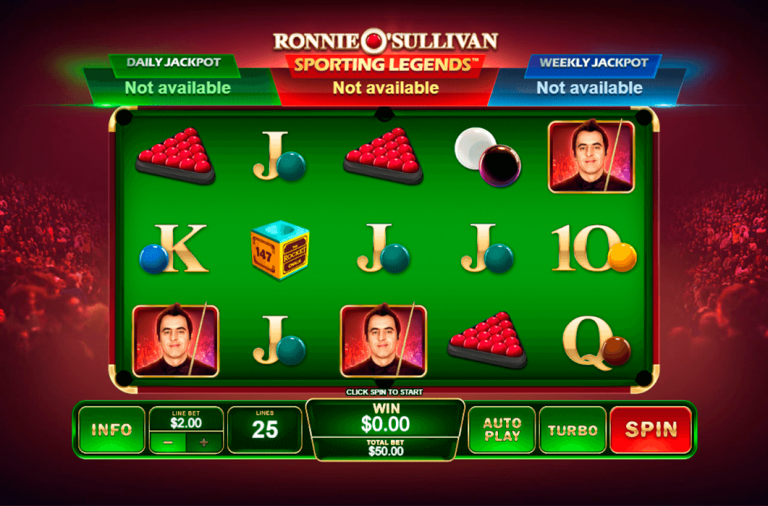 You are given the choice of three different statues, each of which represents a different free spins mode. A casting mould is then smashed to determine how many free spins you win, the more smashes it takes to break the mould, the more free spins you win. The three free spins modes are: Double Multiplier Free Spins, in which the win multipliers are doubled to 2x, 4x, 6x and 10x, Stacked Wild Free Spins, in which one reel will be fully wild with each spin, and Winning Free Spins, in which the free spins counter only decreases on spins that produce a win. All of the free spins modes can be retriggered. 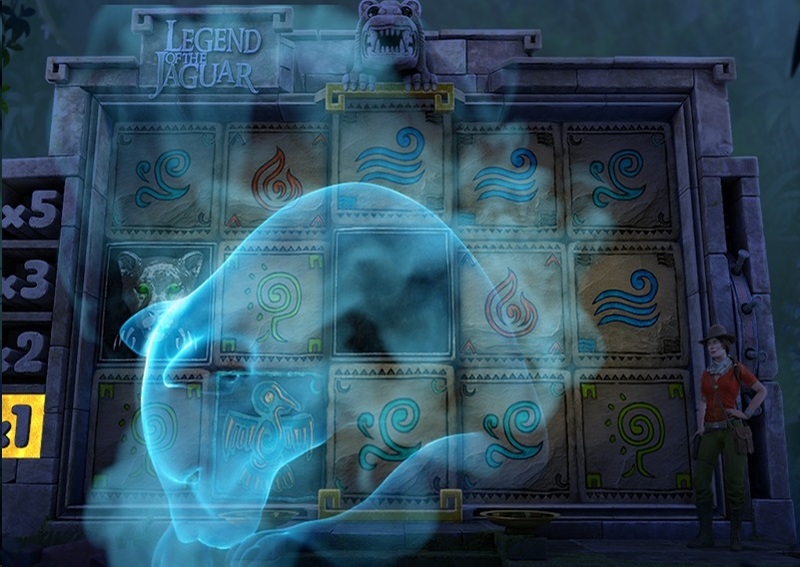 Legend of the Jaguar has a betting range of £0.25 up to £500 per spin. The jaguar offers the top payout of 2,500x, the boar can payout up to 300x, the lizard up to 200x, the bird up to 100x and the fish up to 75x. The tree and fire symbols can payout up to 50x and the wind and water symbols can payout up to 25x. If you are looking for an adventure packed with rewards then this game may well be the one for you. For hundreds of years people have been wondering what the meaning of Stonehenge is, and now Playtech have brought this mystery to the reels in Sacred Stones slot. 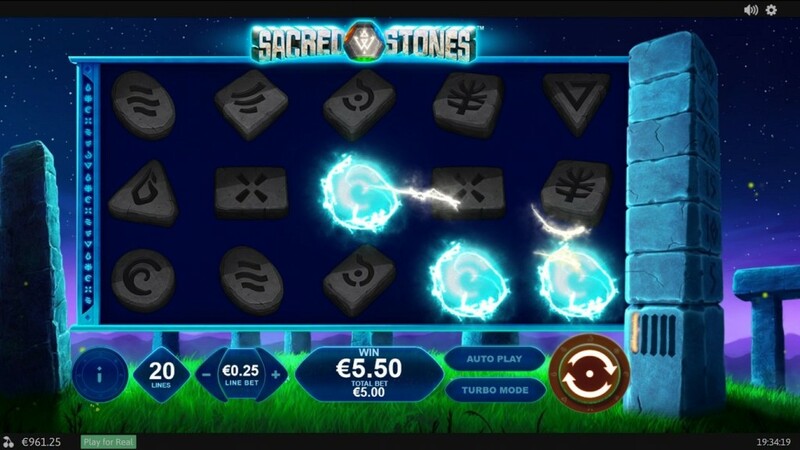 Sacred Stones is a 5 reel slot with 3 rows and 20 fixed paylines. However, the paylines can payout both left to right and right to left so in effect there are double the amount. The reels are set in between the stones of Stonehenge, at the top of the hill and underneath a clear night sky littered with stars. All of the slot’s symbols are different stones with various shapes carved into them. There are red, pink, purple, orange, yellow, green, dark blue and light blue stones. There is also a stone ‘W’ wild symbol. It can land stacked on the middle three reels and will substitute for all of the other symbols to help and form winning combinations. The slot features collapsing reels. This means that every time you land a winning combination, the symbols in it will disappear and allow more to fall from above. Hopefully this will result in another win and the process will repeat itself. As a result, you can land numerous wins from just one spin. With each consecutive win that lands the Stone Pillar to the side of the reels lights up. If you manage to land five or more consecutive spins from one spin then the Free Spins are triggered. Landing 5, 6, 7, 8, 9 or 10 consecutive wins will award you 5, 10, 15, 20, 25 or 50 free spins respectively. Furthermore, during the free spins the collapsing reels are still active so you can land numerous wins from a single spin and trigger more free spins. As a result, the number of spins you can win is unlimited. Sacred Stones has a betting range of £0.20 up to £2,000 per spin so all players can afford to give it a go. 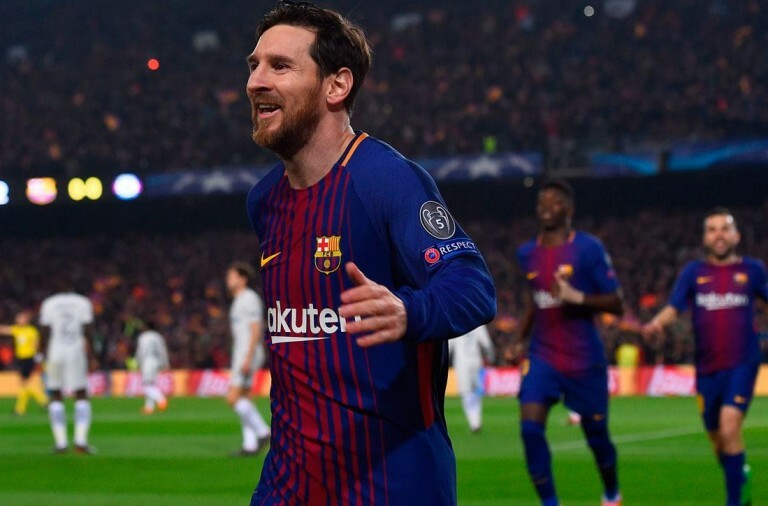 It is also worth remembering that you are essentially betting on double the number of paylines so it is excellent value for money. There is a huge top payout of 1,000x available from the red stone. The pink stone can payout up to 300x, the purple stone can payout up to 150x, the orange stone can payout up to 75x, the yellow stone can payout up to 60x, the green stone can payout up to 45x, the dark blue stone can payout up to 30x and the light blue stone can payout up to 20x. Next time you find yourself pondering the mysteries of Stonehenge, try this slot and with a bit of luck its secrets will be revealed to you in the form of piles of winnings. If you like detective novels, the game Cluedo and solving puzzles then you will love the new Murder Mystery slot from Playtech that will take you on a Victorian era adventure together with a detective as he hunts down clues and solves crimes. 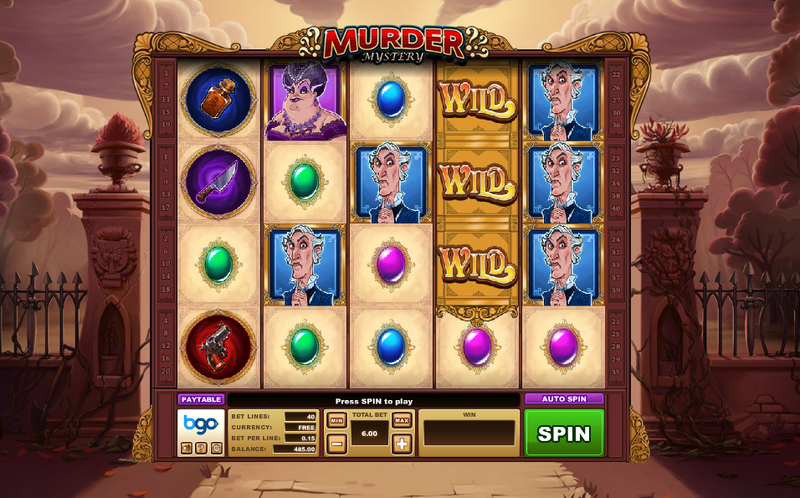 Murder Mystery is a 5 reel slot with 4 rows and 40 fixed paylines. Behind the reels is the fence behind which is a park and an old English countryside manor. There are six high value themed symbols including a young woman, an older woman, a man, a gun, a knife and a bottle of poison. The lower value symbols are red, blue, purple and green gemstones. There is an elaborate gold ‘Wild’ symbol, it can land stacked on all reels and will substitute for all the other symbols, except the scatter symbol, to help and form winning combinations. The scatter symbol is the detective and there is a ‘?’ special symbol. During the base game the Murder Spins feature can be triggered on any spin. There are two different Murder Spins. The Weapon Spin will reveal the murder weapon. Up to twelve ‘?’ symbols can be added to the reels and they will then transform into the same murder weapon to create a guaranteed win. In the Murderer Spin the murderer is revealed and up to 12 ‘?’ symbols are added to the reels before transforming into the murderer symbol to create guaranteed wins. Wild Spins – Triggering this with three, four or five scatters awards 12, 16 or 25 free spins respectively. During the spins two wild symbols will be added to reels one to three on every spin. Reveal Spins – Triggering this with three, four or five scatters awards 6, 8 or 12 free spins respectively. With each spin up to twelve ‘?’ symbols are added to the reels, these symbols will then transform into the same symbol on each spin. Clue Hunt – This is a picking game in which you must hunt for the murder weapon in the garden. Choose from the ‘?’ symbols to reveal murder weapons and win cash prizes. 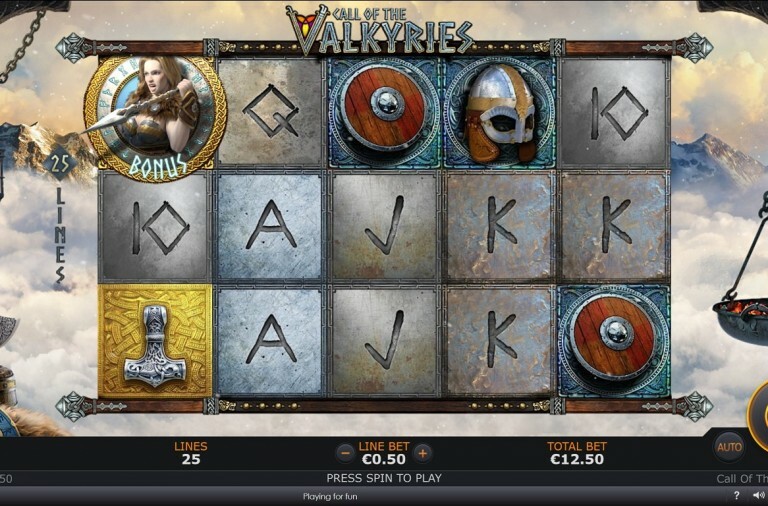 Multi Spins – Triggering this with three, four or five scatters awards 12, 16 or 25 free spins respectively. During the spins all payouts are tripled and Murderer Spins can be triggered on any spin. Furthermore, landing two or more additional scatters will award extra free games. Murder Mystery has a betting range of £0.40 up to £80 per spin. There is a huge top payout of 750x available from the wild symbol. The young woman can payout up to 500x, the old woman can payout up to 400x, the man can payout up to 300x, and the gun, knife and poison can all payout up to 150x. This bonus packed slot promises to deliver hours of fun and with a bit of luck you will also land some huge winnings.